Award Year: 2007 In the face of mounting pressures to contain health care costs and strongly held partisan views about entitlement programs, what does the future hold for Medicaid? Will Medicaid, which costs more than $300 billion annually and provides coverage to some 55 million low-income Americans, be subjected to deep budget cuts? Or can it resist erosion and perhaps even expand to cover more of the nation's 47 million uninsured? Frank J. Thompson, Ph.D. explores these questions in his project, Medicaid: Political Durability, Democratic Process, and Health Care Reform. He examines Medicaid's structure as a federal grant program; its varied constituents, including the disabled and middle-class elderly as well as low-income mothers and children; characteristics of the American political system, such as federalism and party division, that often make program cuts more difficult; and the use of administrative rather than legislative strategies by the Clinton and Bush administrations to try to transform Medicaid. Thompson considers the possibilities for using Medicaid to expand insurance coverage, to shift more long-term care from institutions to communities, and to achieve other reforms that could promote innovation, transparency, and broader participation in policymaking. Frank J. Thompson is a distinguished professor of public affairs and administration at Rutgers University-Newark and at the Rutgers Center for State Health Policy in New Brunswick. Professor Thompson has served as fellow with the U.S. Public Health Service and published extensively on issues of health policy and its implementation. He has focused particular attention on issues of federalism and health care policy, participating in several funded projects related to this subject at the Rockefeller Institute of Government in Albany, New York. Publications from these projects include Medicaid and Devolution: A View From The States (Brookings Institution, co-editor with John DiIulio Jr.) and journal articles focused on the administrative barriers to take-up for children in Medicaid and the State Children's Health Insurance Program. Thompson is researching and writing a book on Medicaid under the administrations of Bill Clinton and George W. Bush. In this regard, he has recently authored papers that analyze the political and health policy implications of the growing use of Medicaid waivers to fuel significant changes in this program. Thompson's research on Medicaid highlights issues of political durability, democratic process, and health policy reform. He received his undergraduate degree in political science from the University of Chicago and his M.A. and Ph.D. in that subject from the University of California, Berkeley. 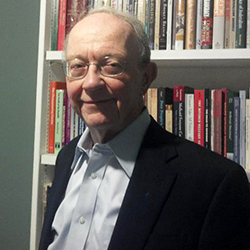 Thompson is a fellow of the National Academy of Public Administration. Thompson, F., Gusmano, M., Burke, C. Health Care Politics and Policy in New York State, In Handbook of New York State Politics, ed. Benjamin, G. New York: Oxford University Press, 2012. Gusmano, M., Thompson, F. J. “The Safety-Net At The Crossroads: Wither Medicaid DSH?” In The Health Care “Safety-Net” in a Post-Reform World. Hall, M., and Rosenbaum, S. (eds.). New Brunswick, NJ: Rutgers University Press, 2012. Thompson, F., Fossett, J. Federalism, In Health Politics and Policy, 4th Edition, eds. Morone, J.A., Litman, T.J., Robins, L.S. Delmar Cengage Learning, 2008. Cantor, J.C., Thompson, F.J., Farnham, J. “States’ Commitment to Medicaid Before The Affordable Care Act.” Inquiry, 2013; 50(1):71-84. Thompson, F.J. “Health Reform, Polarization, and Public Administration.”Public Administration Review, 2013; 73(S1):S3-S12. Thompson, F. The Medicaid Platform: Can the Termites Be Kept at Bay? JHPPL, Jun 2011, 36(3): 549-54. Thompson, F.J., Burke, C. “Federalism By Waiver: Medicaid and the Transformation of Long-Term Care.” Publius: The Journal of Federalism, 2009; 39(1): 22-46. Thompson, F. Medicaid Politics: Federalism, Policy Durability, and Health Reform. Washington, DC: Georgetown U Press, 2012.